I love comics. I love making comics. I love reading comics. I love talking about comics. Every now and then, someone asks me to talk about comics somewhere other than at a convention or online. Like the “Coffee and Comics” storytelling workshop I’ll be doing for the Ohio Center for the Book in conjunction with the Cleveland Public Library. It happens on Saturday, April 27, 10:00-11:30 am at the Rising Star Coffee Roastery, 3617 Walton Avenue in Cleveland, Ohio. Comics are a visual medium. A comics writer must know how to write a script for an artist and the artist has to know how to turn that script into art that carries the story through however many panels and pages said story requires. Writers have to think visually and recognize what an artist can and cannot fit into a panel or a page. That often means killing one’s darlings to keep the story moving. Artists have to think about the story as well. It’s not enough to draw great pictures. Those images have to keep the story moving. Whether you’re a writer or artist, telling the story is job one. For this workshop, I’m going to provide my “students” with random script pages for comics stories in various genres. At the moment, I plan to write pages for a super-hero story, a horror story and a romance/slice-of-life story. This is not the kind of book I would normally review here. It does not have much to do with comics. 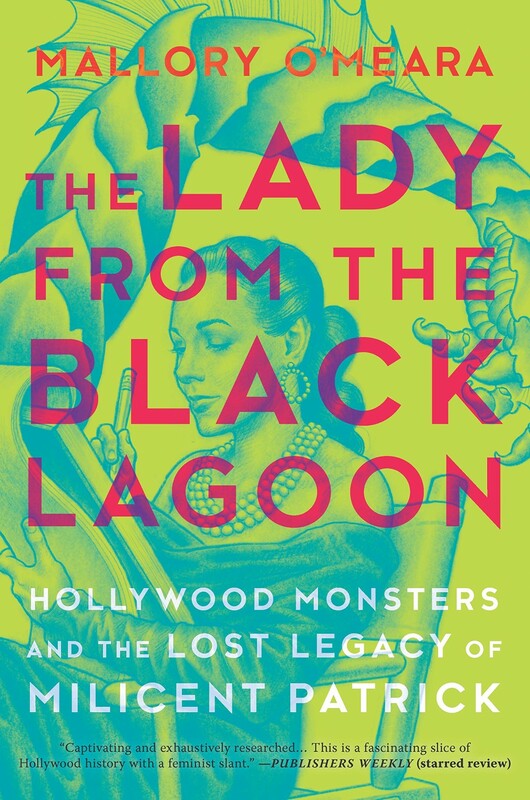 However, Mallory O’Meara’s The Lady from the Black Lagoon: Hollywood Monsters and the Lost Legacy of Milicent Patrick [Hanover Square Press; $26.99] speaks to me on so many levels that I’m making an exception. Milicent Patrick was the woman who designed the Creature from the Black Lagoon, who is not only my favorite of the classic Universal monsters but one of my favorite monsters of all. Horror movie maker O’Meara was inspired by the Creature and, later in her life, by her discovery that a woman was behind the design of the so alien and so human Gill-Man. It inspired her in her own career and it inspired her to learn more about the woman who’d been virtually erased from the history of horror movies. Patrick was an artist, an actress, a designer, a model and so many things. She was a troubled free spirit and so stunningly beautiful that many reporters and researches made her beauty the story. She was sent on a tour to promote The Creature from the Black Lagoon. Part of the tour agreement was that she not claim credit for her work and instead praise department head Bud Westmore, who was one horrible human being. Jealous of Patrick’s fame and talented, the despicable Westmore fired her when she returned from the tour. He also got his brother drunk in order to steal a job from him. Not a good man, but I don’t want to make him the story. Patrick was amazing in every aspect of her life, including, sadly, her inability to overcome a family that considered her little more than a whore. Then and now, that’s the go-to for diminishing an accomplished woman. I certainly relate to her story, albeit in ways I’m not yet comfortable writing about. What I am comfortable writing about is that attempt to erase her. Because it’s common to the comics industry as well. Creators are an inconvenient truth for publishers, editors and even those who write about comics. There are those who try to ignore how much the Black Panther movie owes to writer Don McGregor. For decades, DC Comics went along with the diminishing of Batman co-creator Bill Finger. It’s a comics industry cancer that has been going on since the dawn of the industry. In her role as biographical detective, O’Meara does an incredible job of uncovering Patrick’s story and making it real for readers. There are sections that brought me to tears. Though I got the book through my local library system, I ended up buying a copy to add to my own home library. I love it that much. The Lady from the Black Lagoon is my pick of the week. I recommend it to fans of the Creature, students of horror films, supporters of the enormous contributions women and other outsiders have brought to the cinematic and comics arts. We have to remember these great creators, past and present and future. 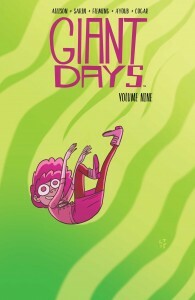 As with previous collections of the title, Giant Days Volume Nine by John Allison and Max Sarin [BOOM! Box; $14.99] was another fun visit with BFFs Esther, Daisy and Susan as they finish their second year of college. I enjoy the characters and how their lives combine comedy drama in roughly equal measures. The stories and adventures contained within are funny, to be sure, but there are also moments of heartbreak and doubt. Even when things get a bit slapstick, the stories feel real. I’m not surprised many consider Giant Days one of the best, if not the best, comics available today. Other than my usual recommendation that you should try Giant Days if you’re not already reading it, I have nothing to add that I can add without spoiling some delicious moments for you. This volume reprints issues #33-36 of the series. The next volume, which will collect issues #37-40, is due in June. I’ll be waiting as eagerly for that volume as I did this volume. I’m having a blast seeking out odd manga series to sample, though I recognize these are only odd from my American perspective. Even our slice-of-life graphic novels tend to be similar while Japanese creators go all over the spectrum. 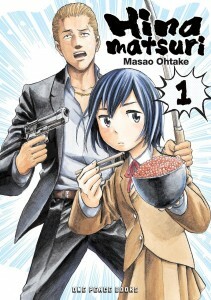 Masao Ohtake’s Hinamatsuri Volume 1 [One Peace Books; $11.95] tells of an ambitious young yazuka member whose life is upended when an oval-shaped object falls into his apartment and “hatches” a young girl with psychic powers. Nitta suddenly finds himself as a father figure to the strange young lady while being driven to exasperation by how little she understands or fits into our world. On the other hand, Hina’s use and frequent misuse of her powers help him rise to higher position in the crime syndicate. I’d describe Hinamatsuri as “dark humor lite.” The reality of the yakuza and their crimes is soft-pedaled with Nitta coming off as a struggling salaryman. I’m not entirely on board with this series, but enjoyed this first volume enough to keep reading it for now. If you’re feeling adventurous, you might enjoy it as well. The second volume is out with the third volume coming in June. Members of the workshop will be encouraged to e-mail their finished pages to me. I’ll be going over every “submission” with the intent of hiring one of these artists to draw an eight-page story for me. I don’t know where the completed story will appear, but the artist I choose will be paid the admittedly low rate of $50 a page for the work. I’ll retain all rights to the work, but that initial $50 page rate will be considered an advance against any future money earned by the completed story. If you come to my workshop and do the work, you could end up as a published artist.